Chicago Blackhawks prospect Adam Boqvist (7) brought down a showering of teddy bears, kicking-off a six-goal output from the London Knights as they won their 14th straight game. The Knights defeated the rival Sarnia Sting 6-3 on home ice as Liam Foudy (13), Josh Nelson (6), Antonio Stranges (6), Evan Bouchard (5) and Alec Regula (3) also found the back of the net. Joseph Raaymakers made 32 saves for the win in goal while 2019 NHL Draft prospect Matvey Guskov had a pair of assists. Franco Sproviero (10, 11) and Ryan McGregor (10) scored Sarnia goals while Ethan Langevin made 36 saves in the loss. London outshot Sarnia 42-35, improving to 3-0 against the Sting this season. The Knights improve to 20-4-2-0 while Sarnia falls to 12-13-2-2. 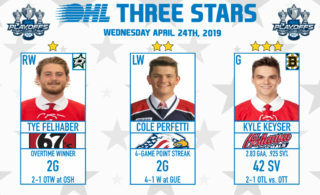 OHL goal-scoring leader Tye Felhaber (27, 28, 29) scored his first hat-trick of the season, doing so naturally in just over 11 minutes to lead the Ottawa 67’s past visiting North Bay 6-3. Felhaber broke open a 3-3 tie 7:08 into the third period before tacking on two more goals to give the 67’s at least a point in their 23rd straight game. New Jersey Devils prospect Mitchell Hoelscher (4) had a goal and two assists while San Jose Sharks draftee Sasha Chmelevski (11) had one and one. Hudson Wilson (2) also scored to put Ottawa up 3-0 before North Bay goals from Brad Chenier (12), Adam McMaster (12) and Luke Moncada (2) brought the score back to 3-3. North Bay outshot Ottawa 43-33 as 67’s netminder Cedrick Andree made 40 saves in the win. Ottawa leads the East Division with a 22-3-3-1 record while North Bay suffers a fourth straight loss, falling to 11-15-1-1. For the second straight game, Keeghan Howdeshell (21, 22, 23) potted a hat-trick in his home state of Michigan. The overage forward followed up Saturday’s hat-trick in Saginaw with three more goals on Sunday, helping the Soo Greyhounds defeat the Flint Firebirds 5-3. Howdeshell scored 33 seconds into the second period before scoring the shorthanded game winner with 32 seconds left in the period. He hit the empty net in the dying seconds of regulation to secure the hat-trick and give the Hounds an eight point lead atop the West Division. Alex Johnston (4) and Morgan Frost (19) also scored for the Hounds, with Frost finishing the afternoon with a goal and two assists. Sault Ste. Marie outshot Flint 45-28 as the Firebirds had a pair of goals and an assist from Jake Durham (17, 18). Ty Dellandrea (13) had a goal and an assist while rookie forward Evan Vierling picked up three helpers. The Hounds are 17-7-4-1 while Flint suffers a fourth straight loss, falling to 3-24-2-0. Boston Bruins prospect Jack Studnicka (11) launched the teddy bears 8:02 into the first period but that’s all the offence the Oshawa Generals would put together on Sunday evening, falling 4-1 to the visiting Windsor Spitfires behind a pair of goals from Luke Boka (2, 3). 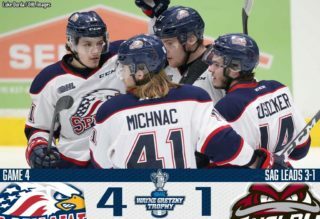 Kyle McDonald (4) and Daniel D’Amico (10) added goals while Michael DiPietro made 24 saves as the Spits outshot the Generals 41-25. 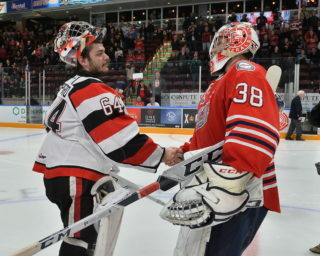 Overage goaltender Cole Ceci made 37 saves for Oshawa as the Gennies fell to 17-9-2-0. Windsor rebounds from a Saturday loss to claim victory, improving to 14-13-1-1. 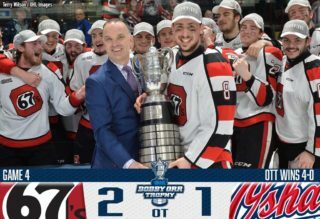 Edmonton Oilers prospect Kirill Maksimov (17, 18) scored twice while rookie Christian Sbaraglia made 26 saves in his OHL debut as the Niagara IceDogs took a 5-1 win in Hamilton. Ivan Lodnia (9) scored on a penalty shot and joined Jason Robertson (27) with a goal and an assist while Bradey Johnson (7) also capitalized. The IceDogs outshot the Bulldogs 41-27 as overage veteran Brandon Saigeon (20) scored the lone Hamilton goal. Niagara earns a third straight win to remain in a first place tie with Sudbury in the Central, holding a 16-7-4-0 record. Hamilton falls to 13-14-1-0, good for fourth in the East Division. The Sudbury Wolves scored seven goals on 32 shots, getting a 28-save shutout performance from Ukko-Pekka Luukkonen in a 7-0 blanking of the visiting Mississauga Steelheads. 2019 NHL Draft prospect Blake Murray (10, 11) scored twice and added an assist while former first overall OHL Draft selections Quinton Byfield (9) and David Levin (13) each had a goal and two helpers. Owen Gilhula (3), Drake Pilon (4) and Owen Robinson (2) added Sudbury goals as the Wolves overwhelmed the Steelheads. Liam Ross and Darian Pilon each had two assists as Sudbury skates to a fourth straight win, sitting tied atop the Central with a 17-8-1-1 record. Mississauga suffers a sixth straight loss, falling to 14-12-2-0. Alexey Lipanov (6) scored five minutes into action and that’s all the offence the Kitchener Rangers would put together as the Guelph Storm proceeded to score eight unanswered in a lopsided victory. Keegan Stevenson (6, 7) and Cam Hillis (6, 7) both scored twice for Guelph while Daniil Chayka (3) and Barret Kirwin (5) each had a goal and two assists. Ryan Merkley picked up three assists while Cedric Ralph (9) and Dmitri Samorukov (1) rounded out the scoring summary. Guelph outshot Kitchener 30-28 as Anthony Popovich made 27 saves in the win. The Storm improve to 14-7-3-3 for second in the Midwest Division while Kitchener drops a third straight decision, falling to 12-14-2-0. The Storm have won three of four against the Rangers this season.